I think cats are brilliant. Mine are certainly fantastic, so at this time of year I think it is very important to treat your favourite feline to a little Christmas cheer. 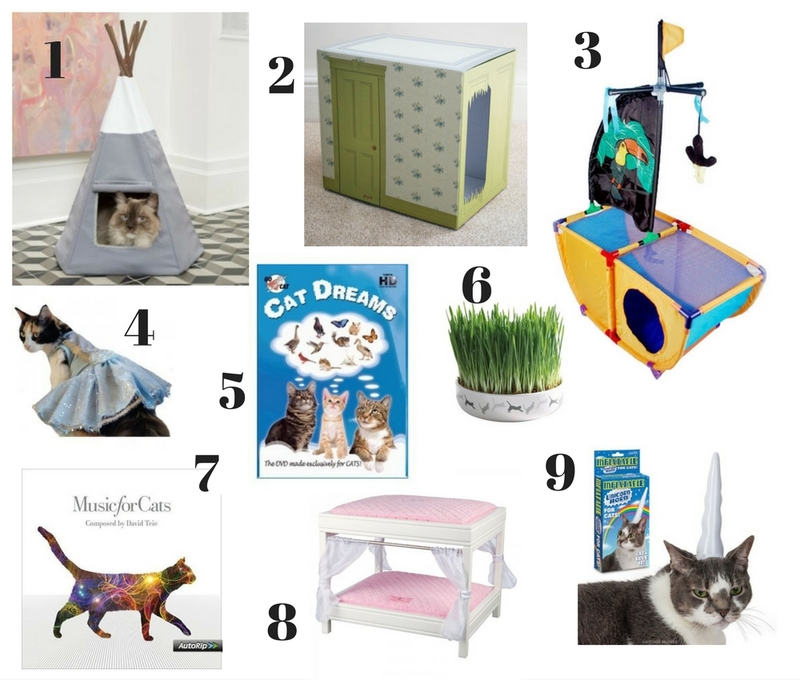 Here is my guide to the best gifts to improve your crazy cat lady rating this Christmas. Cat tee-pee’s can be picked up from Not On The High Street and are perfect for your kitty to settle down in and watch Netflix (Figaro likes to watch detective shows). they can even pop the flap down for a little privacy should they need it. Prices range from around £50 – £75. If you are concerned about turning your cat into a flash and spoilt hipster, Not On The High Street also have a cheaper cardboard alternative, which you can see here, for £22.00 you get an easy to assemble cardboard tee-pee complete with catnip, balls and toys. It can even be used for small pets like rabbits. We have a cat play box very similiar to this, ours is shaped like a little rectangular cottage and has one of those corrugated cardboard scratch bases that our cats love. I love this version, recreating that classic “Here’s Johnny” scene from the always terrifing The Shining. This play box doesnt have a scratch board base which is a bit of a shame but I think a bit of old carpet shoved in the bottom with some catnip popped in would give your cat hours of fun. Available to buy from Not On The High Street for £9.99, it also comes in two other classic movie designs – “Catanic” and “Dogbusters”. Genius. I think this would be perfect for movie geeks and film loving cats alike. For £11.99 from Pet Planet your cat can easily and adorably sail and conquer the Seven Seas. Complete with dangly toys and ribbons this cat activity centre also includes a hidden hidey hole in the bottom for your cat to snooze in once it has plundered the oceans. Made from polyester with thick, stable plastic piping, this lightweight superb Kitty City Caribbean Cruiser is easy to assemble and move around when you are cleaning and secure for your puss to jump on and off. The small mesh tension also means that it is difficult for a nail to get caught in so you can be sure your cat or kitten can play happily and safely. I almost wept with joy when I stumped across this brilliant website – Nip and Bones, there is so much awesome to be found here!! The dress featured is a beautiful, blue princess dress that will set you back $32.99. Available in various sizes. Other beauties you can purchase for your lucky cat include a wedding dress, a mermaid outfit, socks, tshirts, sweaters, ties, collars and shoes. It really is crazy cat lady heaven, you can even purchase pyjamas for the cat here. There are cheaper, potentially more realistic items, such as bow ties for $6.99. With international shipping available why wouldn’t you dress your cats up like mermaids? Available to purchase for £10.00 your feline friends can enjoy 90 minutes of cat friendly footage including gerbils, birds, hamsters and more, complete with a specially designed and created soundtrack. It is apparently cat tried, tested and approved as this cat enjoying the DVD can confirm. This ceramic bowl filled with cat grass is perfect for indoor cats. Grass can aid a cat’s digestion and help to alleviate furballs and other yukky things. Who doesn’t love green tinged cat vom on the carpet. Available for £5.00 from the Cat Gallery. When I first saw this advert on TV, I thought it was a dream I’d had (that happens quite alot, I think things that I have dreamed have actually happened), so I made Neil watch so could confirm it was real and that I wasn’t losing the plot. For £9.99 you can buy it here on Amazon. Want to check out this madness that is the advert? The CD comprises of 5 10 minute cat friendly compositions made up of a collection of sounds and classical music. Your cat can enjoy a little culture this Christmas. For £65.40 from Kitty Kit you can treat your pampered pet to a beautiful pink, princess canopy bed. Complete with removeable curtains and cushions that can be washed. It also has a soft fur roof top so your furry princess can sit atop her princess bed and survey her kingdom. Available from Amazon for £7.78, this inflatable unicorn horn can be fixed to your cats little head so he can experience all the magical joy of being a unicorn. Will you be buying your pets gifts this Christmas? Let me know below!